Former Anglo Irish Bank chief executive officer David Drumm, who is serving a six-year sentence for conspiracy to defraud and false accounting, has pleaded guilty to authorising or permitting unlawful loans to be given to ten developers to buy shares in Anglo in July 2008. He will be sentenced on 9 July. His sentencing will bring to an end nine years of criminal investigations into the former Anglo Irish Bank. 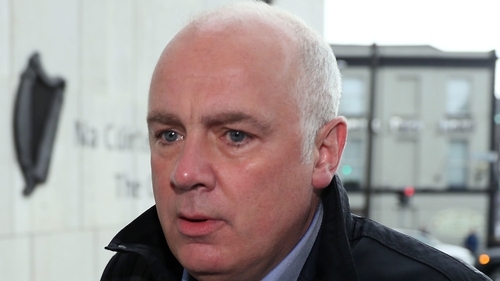 Drumm was sentenced last week to six years in prison for directing a conspiracy to dress up Anglo's accounts by €7.2 billion in 2008 and for presenting the false figures to the market. Judge Karen O'Connor said people were entitled to trust their banks and Drumm had engaged in grossly reprehensible behaviour. He was due to stand trial later this year on further charges of giving illegal loans to ten developers, as well as to members of former billionaire businessman, Seán Quinn's family, to buy shares in the bank. Two former colleagues, Anglo's former director of finance Willie McAteer and Pat Whelan, the bank's former head of Irish lending, were convicted of giving illegal loans to the ten developers in 2014. But they were each sentenced to community service after Judge Martin Nolan ruled the Financial Regulator led them into error and illegality. He found they were involved in a "genuine if misguided" attempt to save the bank and sentenced them each to 240 hours of community service. This morning, ten charges of authorising the giving of unlawful assistance to ten developers to buy shares in Anglo in July 2008 were put to Drumm at Dublin Circuit Criminal Court. Drumm answered "guilty" to each one. Lawyers for the DPP said they would not be going ahead with 21 further charges listed on the indictment against Drumm. This means his trial, which was scheduled for October, will not go ahead and there are no further criminal proceedings pending against former directors or employees of Anglo Irish Bank. The Office of the Director of Corporate Enforcement said that today's events bring to a conclusion its decade-long involvement in matters connected with the former Anglo Irish Bank. In late 2008 and early 2009, the ODCE initiated a number of parallel investigations into potential breaches of company law concerning Anglo. It said those investigations resulted in the DPP directing several sets of charges against individuals including David Drumm, William McAteer and Patrick Whelan. "Those outcomes clearly evidence that there is both the appetite and the capability on the part of the ODCE to tackle serious criminal wrongdoing," the ODCE said in a statement. The ODCE said that "white collar crime" is generally document heavy, with much of it in electronic form, which is increasingly cloud-based. It said the crimes are complex, highly technical in nature and regularly involve a cross-jurisdictional dimension. Many of the offences have also never been prosecuted previously and so raise novel issues for investigators, prosecutors and the courts, it added. The ODCE said its Anglo investigations has been enormously resource intensive, with resources - both Garda and civilian - being used to support the Office of the DPP. It said that with the Anglo-related matters now behind it, the ODCE looks forward to being able to deploy its "available specialist resources to the investigation of other serious indications of wrongdoing". On the Sean FitzPatrick case, in which Mr FitzPatrick was acquitted on all counts, the ODCE said that certain failures in its investigation and prosecution were highlighted by the trial judge. The ODCE said today that steps have been taken to ensure that these issues do not recur.